China’s demographic challenges are well known and largely self-imposed (the one-child policy, the anti-girl policy) and it remains something of a mystery how these will play out and affect the country’s economic future. In the wake of Lunar new year, local Chinese media outlets have been full of discussions of labour shortages as migrants failed to return after their annual visit home. According to anecdotal accounts migrants have been choosing to remain closer to home as more competitive employment opportunities created by the stimulus surge become available in central and western . The worker deficit has been reported at two million in the Pearl River Delta region and almost a shortfall of almost a million in Wenzhou. The Guangzhou daily reported Thursday that the provincial government there had increased the minimum wage by 20% in response to rising competition for migrant labour, with base wage levels there now surpassing those in Beijing. In the near term, wage inflation may start to be a symptom of overinvestment last year just as commodity inflation is. 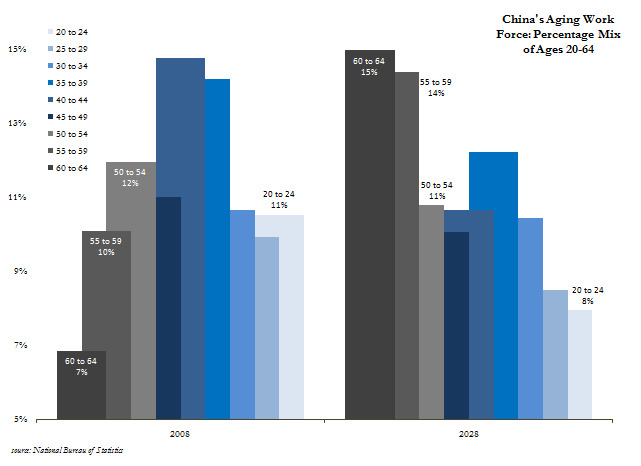 In the long term this short term labour tightness, though caused by regional industrial dynamics, serves as a reminder that China faces a declining working age population in the decades ahead as the impact of the one child policy. The one child rule helped fuel the rapid growth of the past three decades of growth as workers outnumbered dependents but now, with that cycle currently peaking, the total real labour force is expected to contract by more than 20% by 2050. 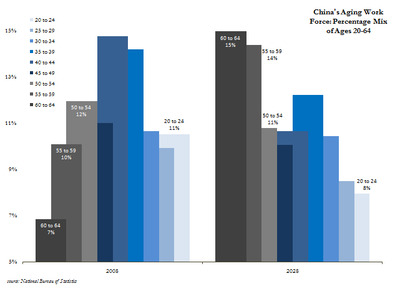 For China a declining work force raises critical issues. As the current work force ages the impact on consumer demand will be significant given the dreadful state of social benefits for pensioners that has encouraged high savings rates. This underscores the need for Beijing to make good on its pledge to increase social welfare programs as pledged during the National People’s Congress earlier this month.